This historic home was purchased by John Miller in 1812 and continued in the Miller family until 1938 when Margaretta Sperry Miller donated the home to Grace Evangelical Lutheran Church to be used as a residence for elderly ladies. In 1948 Godfrey Miller Home Incorporated as a non-profit 501( c )(3) organization and opened as a residence for elderly ladies. After twenty years, the GMH petitioned the court to operate the Home as a Fellowship Center. In 1976 the Godfrey Miller Fellowship Center opened. Today the Judge Robert K. Woltz Pavilion addition has been completed and provides needed space for programs. In 2004 the completely renovated and restored historic Godfrey Miller Home reopened. Private tours of the Historic Home led by trained docents can be arranged for groups (540)667-5869. 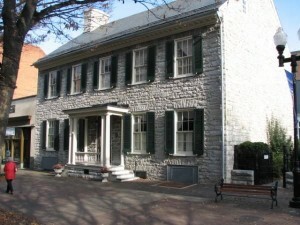 The Historic Home is open to the public the first Friday of each month beginning in April through November. Hours of Operation: Public and private event all year long.